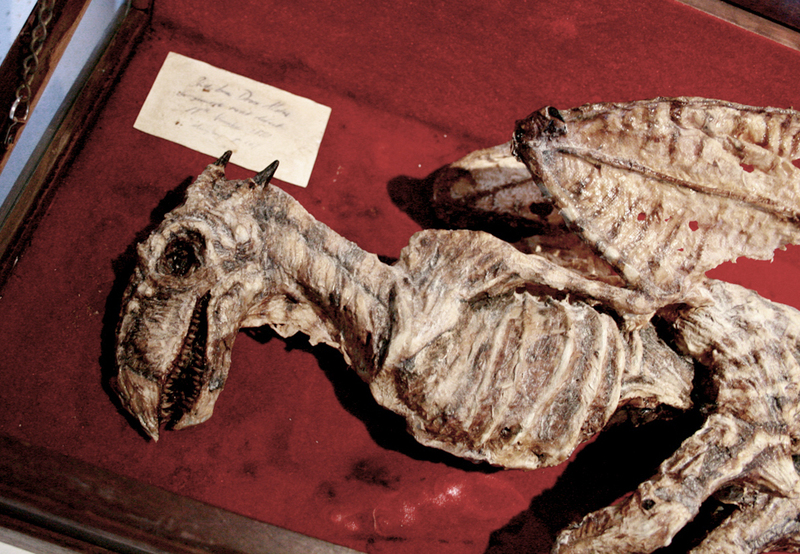 14th century Mongolia saw the death of the presumed last remaining male Draco alatus or winged dragon. With a dwindling matriarchal society with no males, this species would be one of many to face extinction at the hands of man. Hunted for nothing more than fear, Draco alatus, along with its wingless cousin were the only other surviving saurischia post the KT extinction, 65 million years ago. Carrying the membrane winged attributes of the pterasaur with a theropod hipped pelvis, Draco alatus survived in remote far eastern areas seemingly unaffected by the mass extinction. Along with the dinosaurs which would eventually evolve into birds, Draco alatus thrived in the 65 million years before man could become the force it is today. 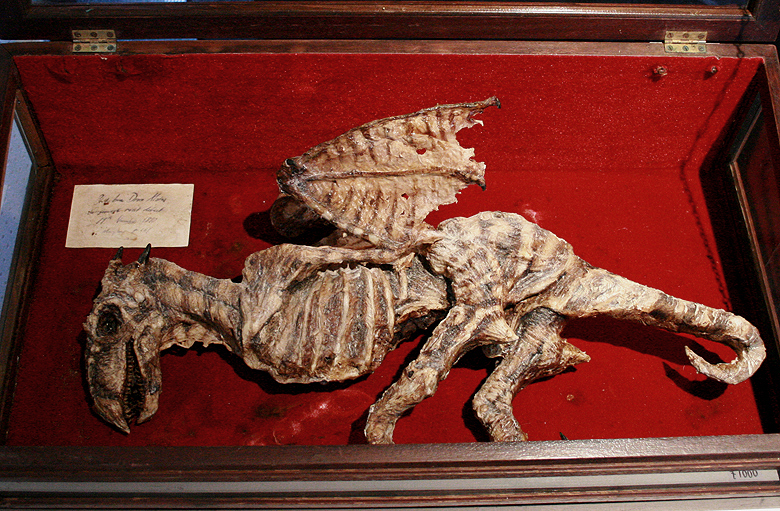 Draco alatus was one of a small subgroup of theropoda which carried a unique self igniting glandular secretion. In the throat were four glands containing an enzyme, when sprayed from the mouth, reacted with oxygen and ignited. According to the little research that is known, these bizarre pyrotechnics are unique to this species, and were used in courting and mating rituals. 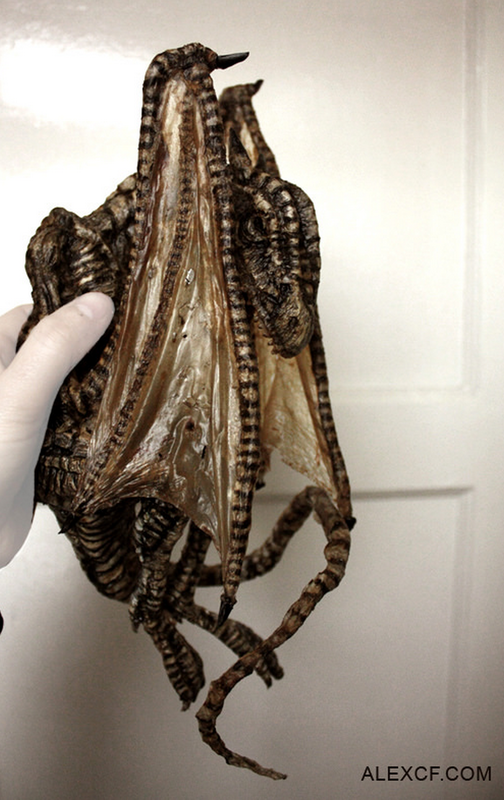 Many preserved dragon skins carry thick burn scars on their flanks, which clotted and healed in various bizarre patterns, not unlike keloid scarring in some human practices. Their skin is like that of a rhino, yet accented with tough scale like plates along the spine. Their wing span at adult size was around 80 feet. Their society was female dominated, males being surprisingly smaller than the females. They are completely featherless, unlike most of their saurian cousins. 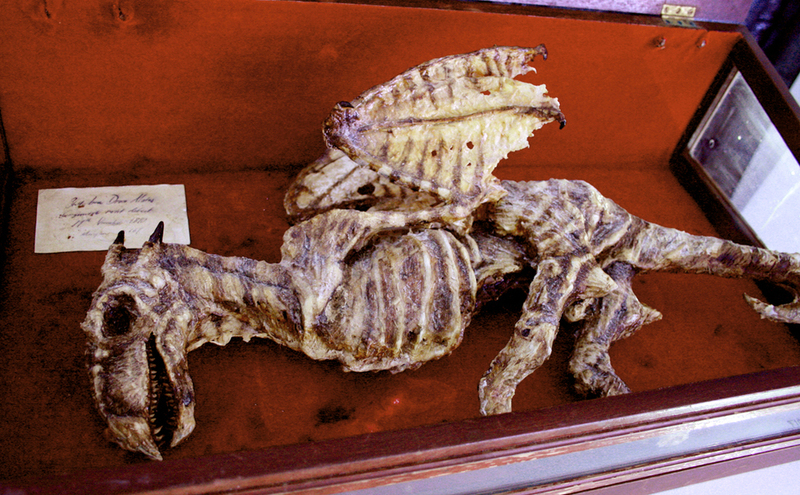 The Merrylin Cryptid Collection added the head of a juvenile male draco, and the bodies of several stillborn infants in 1876, after tracking down a remote group of buddhist monks living in Gurkha Himal, Nepal. They were entirely cut off from civilisation and practiced a form of buddhism known as “agni” (Sanskrit for fire). To the surprise of the explorers, the monks revealed a large flock of Draco alatus living on the south side of a large mountain range. 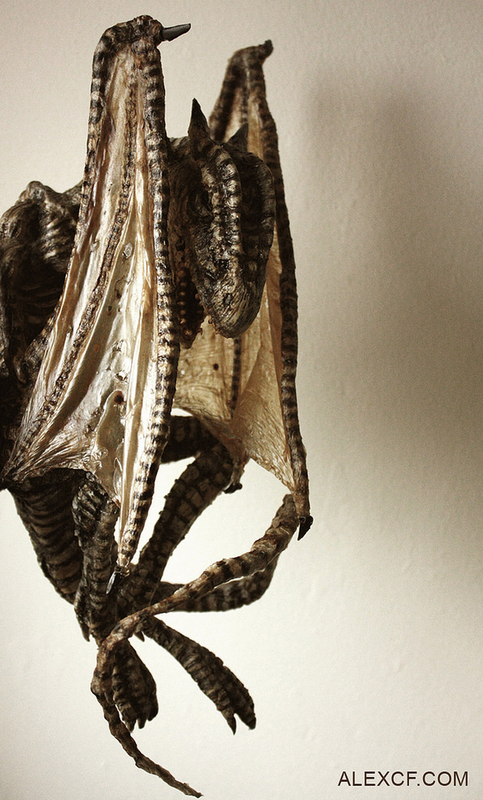 Dressed in coloured fabrics and bridles, the dragons seemed almost domesticated. They were fed on flocks of cattle in the lower plains, seemingly deified by the monks. A young male had died earlier that year from a birth defect, and along with various stillborns, were buried near the monastery. To the horror of the monks, the explorers dug up and stole the head of the animal and the stil born for their western benefactor. 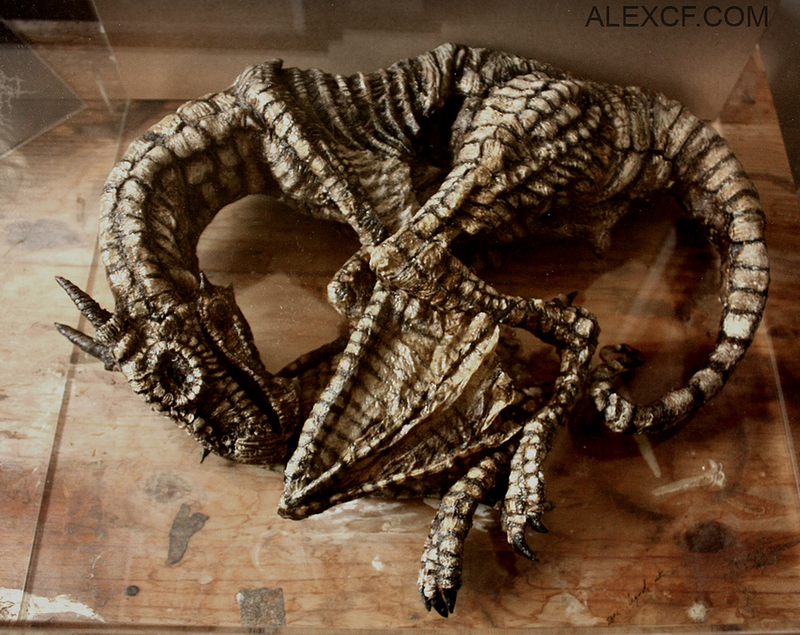 On receiving this piece, Merrylin himself returned to the monastery later that year to see these creatures in the flesh. The entire enclave and flock had vanished, leaving little evidence that they had ever existed. It is presumed that they left to find a more isolated place to continue their worship of these majestic beasts.